Thiruvananthapuram, April 15: Congress leader Shashi Tharoor was injured after he fell while offering prayers at a temple in Kerala on Monday. Shashi Tharoor sustained injuries on his head and was rushed to a nearby hospital. 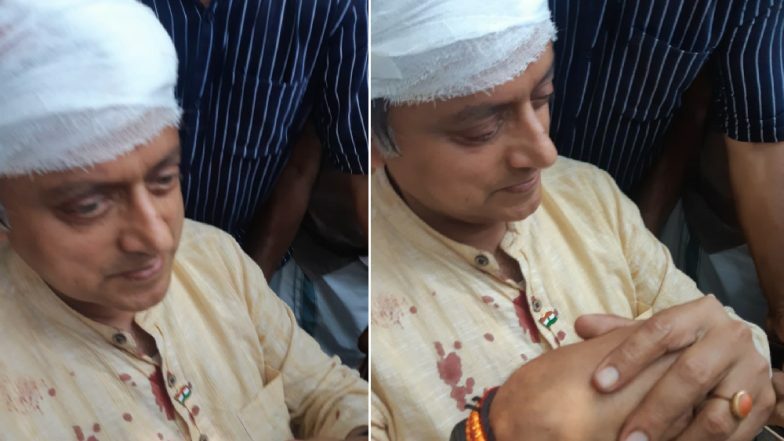 Tharoor, who is contesting Lok Sabha election from Thiruvananthapuram parliamentary seat, was given six stitches and his condition is stable. His kurta was stained with blood after the fall. Shashi Tharoor Asks Will PM Modi Have Courage to Fight from Kerala or Tamil Nadu. The incident took place when Tharoor was weighing himself on a giant scale as part of the "Thulabharam" ritual in which a person sits on the scale against a mound of offerings like fruit and sweets, equal to the devotee's body weight, a report said. Shashi Tharoor Moves Election Commission Against BJP and Sabarimala Karma Samithi Over Violation of Model Code of Conduct.